This modern Fresco 5ft x 2ft 6" Solid Oak Dining Table with six Braced Scroll-Back Leather and Oak Dining Chairs will add a sense of elegance to any dining room. 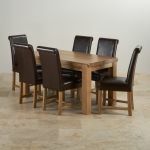 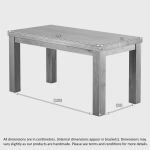 To meet our exacting standards of quality, the dining table is made from only premium solid oak timbers. 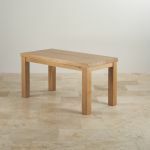 The exquisite grain patterns are given centre stage and are subtly enhanced by a coating of clear wax polish, which also offers protection from daily wear and tear. 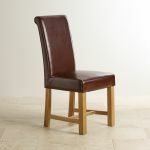 Accompanying the dining table are six braced, scroll-back dining chairs which are upholstered in the finest leather for a wonderfully soft finish. 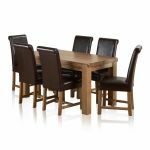 Designed to offer style, practicality and exceptional durability, this dining set is destined to enhance traditional and contemporary dining rooms alike. 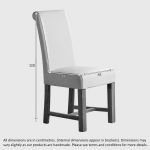 What's more, it's made to match the rest of the Fresco range perfectly - so don't forget to check out our other items, too.